Case law is the collection of reported cases that form the body of law withing a given jurisdiction. It is based upon judicial opinions by various courts, which may set future precedent. Courts in the United States adhere to stare decisis, which generally means that courts respect and adhere to the precedent of previous decisions. However, a court does not have to stand by a decision that is not binding precedent. Generally courts will follow the decisions of higher courts in their jurisdiction. Therefore the effect of a court's decision on other courts will depend both on the level of the court and its jurisdiction. A decision by the United States Supreme Court is binding precedent in all courts. A decision by the United States Court of Appeals for the 11th Circuit would not be binding on the United States Supreme Court or courts from another circuit. However, it would be binding in all lower courts of the 11th Circuit. Not all case law is published. Generally, appellate court decisions that will be used as future precedent are published (reported) in sources (case reporters) specific to that court. Attorneys use published case law as a means to interpret the law. For these reasons, few trial court decisions are published in case reporters. A case starts at the trial court level, which could either be a trial by judge or trial by jury. Generally, evidence and witnesses are presented at the trial court level. An appellate court will hear appeals from parties seeking to change the result of the case heard at the trial court. An appellate court will not answer questions of fact, meaning they will not review the evidence in a case. Instead, the appellate court rules on questions of law, which means it considers legal issues. Because of the parallel system between state courts and federal courts, researching case law can be difficult and complex. A researcher will often need to determine if their issue is one that is inherently federal or state. Even then, some issues can overlap each other and require a state and federal analysis. The Supreme Court of the United States Most of the cases heard are appeals from lower courts and cases from state supreme courts which involve a point of federal law. The court has discretion to decide which cases it will consider. 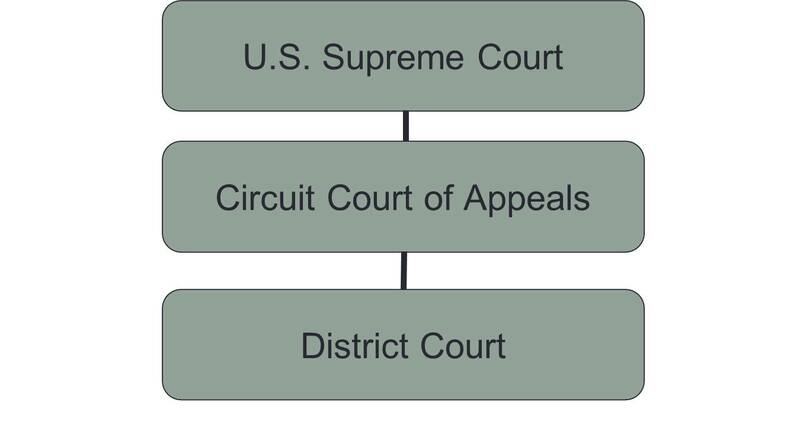 The United States Court of Appeals Made up of appellate courts which deal with appeals from the district courts in their circuit. There are 11 circuit court of appeals, plus 1 federal circuit court of appeals. United States District Courts Trial courts which deal with violations of federal criminal law, disputes regarding federal laws or treaties, and some cases involving residents of different states. The following link provides a map and additional information on the 11 circuits, the federal circuit, and the Supreme Court. A researcher will not always have a case citation when they begin their research. Often times a researcher will have an issue or topic that are looking for case law on. Without a case citation, a researcher would have a daunting challenge trying to go straight to a case reporter and locate a case on their topic. However, there are several avenues that a researcher can go down if they do not have a citation for a case. Annotated Codes (statutes): annotated codes such as the United States Code Annotated (West) or the United States Code Service (LexisNexis) provide researchers with citations to case law. Digests: provide an indexing function for cases in the National Reporter system. Legal Encylopedias: cover a wide range of topics that are arranged alphabetically. Many of the topics include footnotes with citations to relevant case law. LexisNexis Academic: research system that allows users to search for cases by party name, case citation, or by keyword searches. Each of these methods are described in more detail in the boxes that follow. Annotated codes produced by West and LexisNexis are a great way to find cases on a particular topic. As mentioned on the Legislative tab, not every law is statutory law, therefore this would not be a good place to find cases where the underlying law is not rooted in statutory law. However, for issues that do invoke statutory law, the annotated codes are an efficient way to find cases that have cited that particular statute. Both the United States Code Annotated and the United States Code Service provide case citations after the text of the statute. The cases will be grouped together by topic and they will often include a short summary. This provides the researcher with an easier method of locating case law that deals with their particular issue. For more information on finding a statute in an annotated code, please refer back to the Legislative tab. West's Digests provide an indexing function for the cases in the National Reporter System. The digests allow researchers to locate cases by subject from any jurisdiction. In addition, the digests provide an abstracting function, giving researchers short summaries of the points of law discussed in the indexed opinions. This enables researchers to determine if a case would be worth further exploring without having to read the entire case. The Digest System sub-divides the law into over 450 Topics, which are broad legal issues, and then further sub-divided into Key Numbers, which are assigned to specific legal issues within the broader issue. Topics and Key Numbers are consistent throughout West's System - the same subject arrangement is applied to all cases from every jurisdiction, so that if you find a case from one jurisdiction that discusses a legal issue you are researching, you can use the topic and key number for that isssue to find other cases from other jurisdictions that discuss the same issue. Remember that you need to know both the topic AND the key number to search the digests. Table of Cases: The table of cases lists all of the cases indexed in the digest in alphabetical order. In addition to the case name and citation, the table of cases also provides the Topics and Key Numbers that apply to that particular case. This is a great way for a researcher to find the citation for their case if they have the name of the case. Additionally, this is also a great way to see all of the Topics and Key Numbers that apply to a particular case. This may lead to futher investigation of those Topics and Key Numbers, which could produce additional cases on the issue for the researcher. Desciptive Word Index: The descriptive word index allows researchers to search by topics and subtopics. A researcher may start with a broad topic and then narrow down the topic to a subtopic. A subtopic will either provide the appropriate Topic and Key Number where one can find that topic, or it will refer the researcher to another topic. The index also includes a table at the beginning which lists the topics in order and their abbreviations used in the index. A user who is doing research on "abduction" would first go to the Descriptive Word Index. The index is usually several volumes of the digest, generally located near the end of the set of books. Looking under "abduction," one would find several subtopics. If one was only concerned with the criminal liability involved in abduction, they they would look at "CRIMINAL liability" under the term "ABDUCTION." Criminal liability provides the user with the Topic and Key Number Crim Law 45.10. The front of each index provides the researcher with a list of digest topics and what the abbreviations mean. In the case of our example, Crim Law would mean topic Criminal Law. Topics are in order alphabetically in the digest. Therefore, to locate Criminal Law, one would need to just look on the spine of the book until the come to the appropriate volume. Once at the appropriate volume and topic, the researcher can flip to Key Number 45.10. Key numbers will be in chronological order in each topic. Once at the correct key number, the researcher will see lists of cases with ciatations and short summaries of those cases. If the case appears to be on point with what the researcher is looking for, then they can take down the case citation and retrieve that case from the appropriate reporter. Legal encyclopedias are another great way to find case citations on topics. Generally, a legal encyclopedia is arranged alphabetically by topic, which are further divded into more detailed subtopics. Legal encyclopedias provide broad coverage of American state and federal law, including excerpts from judicial decisions and statutes. For researching federal law, the two most popluar legal encyclopedias are American Jurisprudence (AmJur) and Corpus Juris Secundum (CJS). Both of these publications provide researchers with a summary of the state of the law along with references to West's Topic and Key Numbers. Researchers can search for their issue in AmJur and CJS using the General Index. Similiar to other indexes, the General Index is organized alphabetically by topic, with each topic divided into subtopics. Citations are provided in Topic and Section format. An abbreviations table is provided at the front of each volume of the general index to aid researchers in identifying topic names in the index. Similiar to digets, once a researcher has the topic name and section number for their specific subtopic, they can browse the spine of the books and look for the topic name. Once at the correct topic name, they can then look for the appropriate section number. Sections are listed in chronological order. In addition to the General Index, AmJur also includes a volume entitled "Table of Laws and Rules." This volume has several tables which provide cross references from United States Code Annotated sections and Code of Federal Regulations sections to topics and sections in AmJur. This enables researchers to find articles citing those particular laws and regulations, which could lead to further case citations. LexisNexis Academic provides users with a powerful tool for retrieving case law. Available through the University Library, LexisNexis Academic allows researchers to search for case law using a variety of methods. By Citation: If a researcher knows their citation already, then they can plug that into LexisNexis Academic and it will retrieve the case. Citations should be provided exactly as they written. Ex. The citation for Roe v. Wade is 410 U.S. 113. Therefore, when entering this citation in LexisNexis Academic, the researcher should type "410 U.S. 113," and not a variation, such as "410us113." By Parties: If a researcher knows the parties to a case but not the citation, then they can enter in those party names and retrieve cases with those names. This could lead to more than one results, especially if the party names are common such as "United States v. Smith" or "State v. Williams." In those instances, LexisNexis Academic will warn a user tha the results are a high number and ask if they researcher plans to proceed. However, if the researcher does continue with the search, they will be provided with a list of courts on the left and how many of the retrieved cases are from that court. This allows the researcher to narrow down the list to only a few sources. Therefore, a researcher should not only know the party names, but also have a good idea of the court or state from which the case originated and, if at all possible, the year of the decision. By Topic: A researcher can also retrieve cases by searching for a particular topic. Researchers should limit topics to a few words so that searchers only return relevant sources. Similar to searching by parties, results for searching by topic will provide researchers with a breakdown on the left side of the courts where the cases were retrieved so that researchers can narrow down their search to a specific court and state. Keyword Search/Cases: Doing a keyword search under cases allows for users to enter keywords, exclude words from searches, specify dates, as well as select the jurisdiction. Printed Reporters and LexisNexis Academic are not the only places researchers can access case law. Many websites are devoted to providing free access to case law. Although not comprehensive, many of these websites do offer a good amount of case law if someone knows what they are looking for. Justia provides legal information on numerous legal topics and jurisdictions, including federal and state case law. The "Federal Law" section provides users with links to all of the Federal Courts' pages which provide court decisions. Although not comprehensive, many of these pages do provide case law from at least the mid-1990's. This is a good source of free case law. Contains links for both state and federal cases. Opinions are categorized by jurisdiction. Some reporters only include cases from a specific court. For example, the United States Reports only publishes opinions from the Supreme Court of the United States. On the other hand, some reporters includes cases from courts within a specific geographical region, also known as regional reporters. For example, the South Eastern Reporter publishes reported cases from the southeastern United States, such as Georgia and North Carolina. Moreover, some reporters only publish cases on a specific topic, such as bankruptcy or tax. In addition to these designations, reporters are also classified as official or unofficial reporters. An official reporter simply means that it is the publication designated by statute or court order as official. Generally it will contain only the text of the opinion. A case published in an unofficial reporter will include the same text of the same case from the official reporter, but it will also include headnotes, topics, key numbers, and other aids to assist researchers. As mentioned above, a case can be published in an official reporter and an unofficial reporter. For that reason, a single case may have 2 or more citations. When a case has more than one citation, the subsequent citations are known as parallell citations. A classic example of this is Bush v. Gore, 531 U.S. 98, 121 S. Ct. 525, 148 L. Ed. 2d 388 (2000). As one can see, not only is Bush v. Gore cited in the official reporter (United States Reports), but also in two unofficial reporters (Supreme Court Reporter and Lawyer's Edition. Here is a breakdown of the citation for Roe v. Wade, 410 U.S. 113 (1973). From this, a researcher can determine that the case Roe v. Wade is located in United States Reports, Volume 410, Page 113. Thus, a researcher would be able to either of these 3 reporters and find the same case using that reporter's volume and page numbers. A researcher may also come across a citation that includes an additional number after the page number. This additional number, numbers or range of numbers are called pinpoint cites. Cases and articles will often use these to refer researchers to exactly where the thought arose from. Here is an example using Bush v. Gore, 531 U.S. 98 (2000). Bush v. Gore, 531 U.S. 98, 100 (2000). Citing specifically to page 100 of Volume 531 of the United States Reports. Bush v. Gore, 531 U.S. 98, 100, 104 (2000). Citing specifically to pages 100 and 104 of Volume 531 of the United States Reports. Bush v. Gore, 531 U.S. 98, 100-102 (2000). Citing specifically to pages 100 through 102 of Volume 531 of the United States Reports. Cases cited to Federal Reporter will have an extra element in the citation to identify the court. Unlike the United States Reports, Supreme Court Reporter, and Lawyer's Edition, which only publishes cases from the Supreme Court of the United States, the Federal Reporter publishes cases from several different courts. Therefore, cases published in these reporters include an element in the parentheses to identify the court that rendered the decision. Here is an example using United States v. MacDonald, 531 F.2d 196 (4th Cir. 1976). In this case, the deciding court is 4th Cir. which means United States Court of Appeals, 4th Circuit. Each circuit court will have its own abbreviation which will help the researcher identify the court that rendered the decision. This is important for researchers because they might only want to find cases from their jurisdiction. Similar to the Federal Reporter, cases cited to the Federal Supplement will also include an extra element in the citation. Cases cited to the Federal Supplement are United States District Court decisions. Therefore, an extra element will be included in these citations so that a researcher can determine which court rendered the decision. Here is an example using Jenkins v. Byrd, 103 F. Supp. 2d 1350 (S.D. Ga. 2000). In this case, the deciding court was the S.D. Ga, which means the United States District Court,Southern District of Georgia. Because there could be several United States District Courts inside one state, a researcher unfamiliar with a state may need to look up the court abbreviation to determine which court is referenced in the citation. Northern District of Georgia N.D. Ga.
Middle District of Georgia M.D. Ga.
Southern District of Georgia S.D. Ga.
For additional district court abbreviations, please refer to George Butterfield's libguide titled Legal Abbreviations. Legal Abbreviations guide from Creighton University of Law. Here are some research guides created by other law schools that might be helpful in explaining how to conduct case law legal research.